Saxophonist Jason Weber is known by his albums 1st Avenue (1997), Snow (1998), Leap of Faith (1999), Something Blue (2002), Can U Feel Me Now? (2005) and Five (2009). As in-demand musician he often performs in the San Diego area. If you want to attend his show, I recommend you the Falkner Winery in Temecula, CA, where Jason is performing on most Sundays. Jason’s lively, contemporary jazz saxophone performances have been enjoyed by aficionados throughout Riverside, San Diego, and Orange Counties for years. Los Angeles-based guitarist Michael Rosati started his solo career with the album Pure Love (2005). Jason soloed on the song Shooting Star. Now both re-union on their second project Bringin' It (2011). They are supported by keyboardist Brad Cole, who also co-produced Michael's debut album. Further musicians on this album are drummer Steve Ferrone and the bassists Nathan Brown, Darryl Williams and Chris Kringel. Funk is in the house. 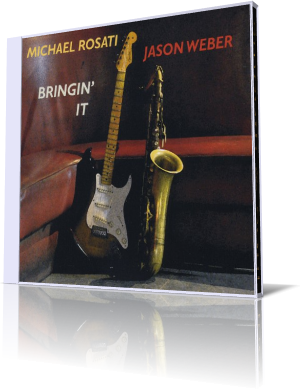 With Bringin' It Rosati and Weber serve a big dose of funk. Jason's amazing blow is comparable with Maceo Parker's style, powerful, heavy, just terrific. On the next song Freedom the group performs more mellow tones. While Grover Washington's influence on Weber's sax play is easy to recognize, Rosati is more inspired by the great jazz guitarists he met in his personal life. The group walks a step further with Luisa. A tune in Big Band fashion. I don't know, why Weber and Rosati entitled the following tune Mickey Pop. Perhaps the reason is the narrative character of Jason's sax performance. On Don't Call Me Surly Jason reflects more on dark and deep tones building a mighty arrangement of brass. Jason Weber and Michael Rosati follow on their EP Bringin' It the path to diversity. Switching between various styles is their secret recipe.